Roads, congestion and safety under the spotlight in Belgium again. Also, megamodel in Transfagarasan road trip. More – and more and more – migrant trouble at Eurotunnel, just when the worst seemed past. New truck safety study, and maybe Highway Code too, as transit country tops congestion charts, again. New figures from traffic monitor INRIX show Belgians lost an average of 51 hours each in traffic last year, by far the most in Europe. Belgium was well ahead of the second-placed Netherlands (41 hours), and next-placed Germany (39 hours), Luxembourg (34 hours) and the UK (30 hours). The list was rounded off with Ireland (24 hours) and Italy (20 hours). Belgian roads suffer much more than chronic congestion. A tragic accident on the R0 Brussels ring road on Friday has triggered a review of truck safety. 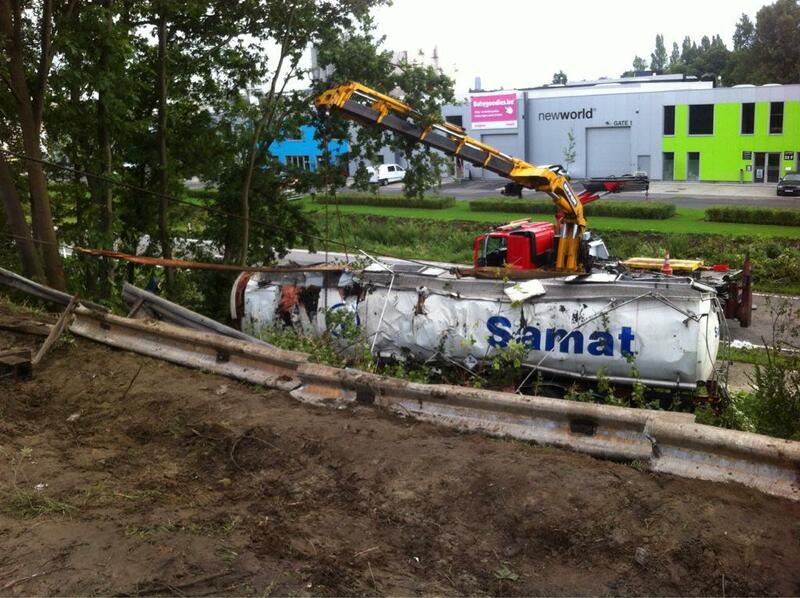 Two people died, and the road was shut for sixteen hours, after a truck piled into the back of a traffic jam in Strombeek in the early hours of the morning. The Belgian Institute for Road Safety (BIVV) was already on alert after deaths in accidents involving trucks doubled last year compared to 2013. The research project will start next year and report before the end of 2016 according to Deredactie.be. BIVV also said earlier this month that the forty year old Highway Code needed to be completely re-written as it used out-dated language and was confusing for drivers. Meanwhile, a survey of 2000 drivers by motoring organisation VAB, published at the weekend, highlighted poor road surfaces and lack of road markings as the major issues on the motorway network. Like neighbouring Luxembourg, Belgium is an outlier in Western Europe with 65 and 64 traffic fatalities per million inhabitants respectively, compared to 28 in the Netherlands and 42 in Germany. A controversial article for the UK Guardian last year – the last time Belgium topped the congestion charts – blamed the traffic woes on tax breaks which encouraged the almost universal use of company cars, a commuting culture, an ill-conceived road network (focused on Antwerp and Brussels) and a lack of public transport. What it failed to mention was the sheer amount of transit traffic passing through, between the Channel ports and Western Europe, particularly on the E40 motorway via Brussels, one of Europe’s busiest roads. No two ways about it, Belgian motorways can be fast and furious, especially E40 at busy times. Drivers put off by this are advised to consider alternative routes such as the A25-E42 via Lille and Charleroi or, our favourites, the extensive and brisk network of, often-dual carriageway, N roads. 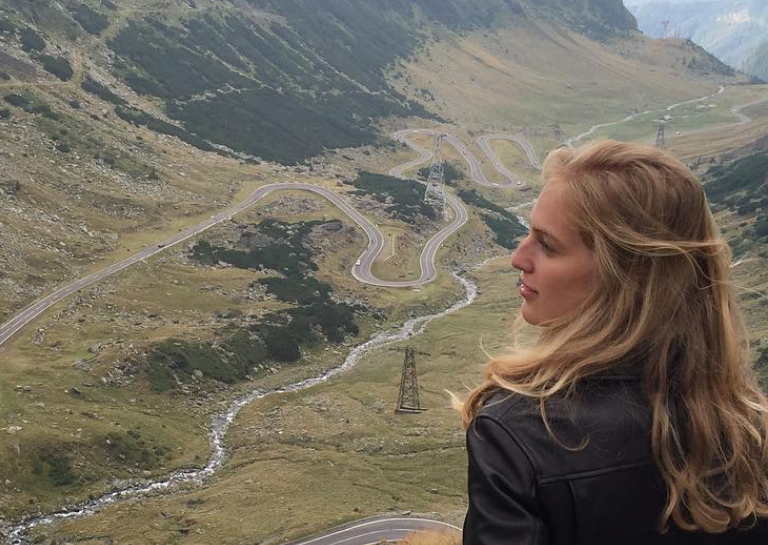 Calvin Klein, Chanel and American Vogue model Vanessa Axente is on a road trip around Romania. ‘Jeremy Clarkson said Transfagarasan is ‘the best road in the world’ – I always wanted to drive here and finally I made it!’ she said yesterday. Since making her international debut in 2012 – for Prada – the nineteen year native of Nagylengyel, western Hungary, near Lake Balaton, has dominated the upper echelons of the industry. Having just sailed along the Mediterranean coast from Nice to Cinque Terre, it’s not clear if the Romania trip is work, or yet more pleasure. Look out for the results in a newsagent near you soon. roundup: EUROTUNNEL. For the second time in a three days, migrants were spotted inside the Channel Tunnel yesterday afternoon, bringing operations to an immediate halt and subjecting passengers from France to delays of more than seven hours by last night. The migrants are believed to have gained access to bulk freight trains in a yard outside the terminal, not the passenger or HGV freight shuttles. Formula One commentator Martin Brundle, on his way back from the Belgian Grand Prix, said, ‘I’ve been very lucky at the French side of the Chunnel tonight on the bike. Sorry if you’re stuck in the queue, that looks epic.’ @RSDriver00 said, ‘Chunnel was pretty bad. Upgraded to Flexi Plus 30mins out and avoided what appears to be 7.5hrs wait.’ The disruption comes after France and the UK signed a new security deal last Thursday, when confidence was high that Eurotunnel had seen the worst of the trouble. The focus had been expected to shift to other ports but it seems the migrants are determined to stick with Eurotunnel’s premium high-speed service. Update: the Tunnel was disrupted by at least three separate migrant incidents today (Monday).